Do barriers currently prevent women from successfully pursuing positions of leadership within sport? The numbers certainly say so. Fewer than three in 10 directors on Canadian National Sport Organization (NSO) Boards are women, and only 17% of head coach positions in Canadian Interuniversity Sport are occupied by women. Meanwhile, men are approximately two to three times more likely to be coaches, officials or in other sport leadership positions. The current reality of female leadership in sport motivated viaSport, along with the Canadian Association for the Advancement of Women and Sport and Physical Activity (CAAWS), ProMOTION Plus and BC Soccer, to build awareness around the benefits of creating gender diverse leadership in sport and physical activity. On March 8, International Women’s Day, more than 100 champions of gender equity came together to discuss how sport can be strategically adapted to deliver positive and relevant experiences, as participation in sport has been declining over the last 20 years. Moreover, dialogue around how sport can, and must better, engage girls in the experience and empower women into leadership roles was a key focus for the day. As leaders, everyone has the ability to foster impactful change. In light of this, the question posed to attendees was: How are you ensuring that your behaviours are helping to build a stronger sport system that seeks to make sport an inclusive and positive experience for all? The day started off with a diverse, female panel including corporate CEO Launi Skinner of First West Credit Union, international FIFA referee Michelle Pye, youth leader and founder of Sole Girls, Ashley Wiles, and Olympian and strong advocate for Canadian women in sport, Marion Lay. Moderated by Shaunna Taylor, Executive Director, PacificSport Okanagan, these leaders spoke passionately about the complexities and lessons learned as they journeyed along their own path as female leaders in sport and business. Afterwards, attendees participated in the Female Coach Mentorship Model facilitated by Allison McNeill, previous Head Coach to the Canadian Women’s National basketball team, and Allison Sandmeyer-Graves, CEO of CAAWS. When current structures and narratives aren’t allowing females to participate and succeed, a shift in culture needs to happen. In order for overarching beliefs and behaviours to change, everyone has a role to play. Organizations need to set the example by empowering female leaders, officials and coaches, and ensuring places of work and play are gender neutral. Women need to know their value and never downplay the fact that they are female. Moreover, mutual interest goes a long way. In order for others to pay attention to your own interests, you need to care about theirs. Collaboration is absolutely necessary for greater collective impact and shared value for purposeful change. It involves taking big ideas and breaking them into smaller chunks to find a common purpose with others. Take the time to develop meaningful connections with those who are like-minded, rather than engaging with as many people as you possibly can. After all, relationships are developed, one person at a time. Additionally, when starting a collaborative group, ask what is needed to make the collaboration process work. By ensure that both positive and negative feedback is welcomed, you create the opportunity for open and productive dialogue. 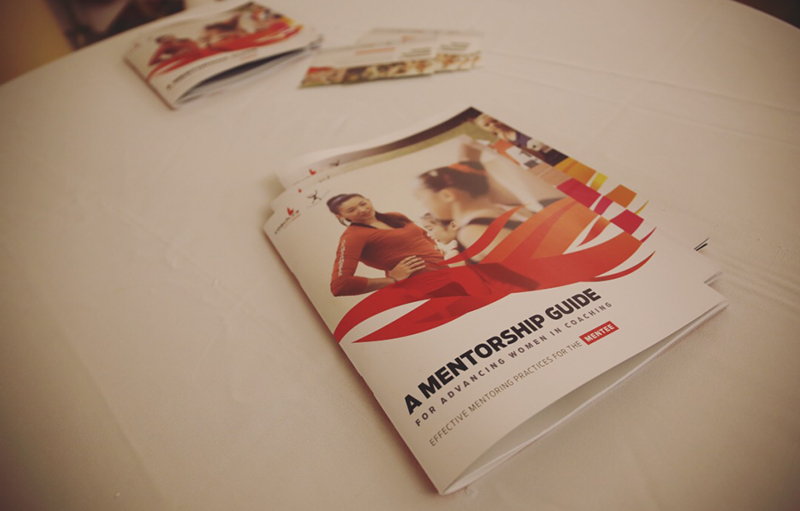 Mentoring is an effective way to directly support and develop female leaders. It allows mentees to nurture their own potential for growth while allowing the opportunity for mentors to practice knowledge-sharing. It’s important to ask yourself what the goal and vision for the mentorship relationship is beforehand. Commitment also plays a huge role within the relationship. Ensure that you have the time and resources to mentor or be mentored. Lastly, an exit strategy should be considered between both parties before pursuing any mentorship opportunity. It’s okay to feel that the relationship isn’t working, or that you aren’t getting what you would like out of it. Change is happening, and the timing couldn’t be better to continue to advance the role of female leaders in sport. In late February, the federal government announced their commitment to achieve gender equality in sport at every level by 2035, providing an initial $30 million over the next three years to promote women and girls’ participation in sport through research and innovative practices. Within our own province, gender equity has witnessed an increased focus with the appointment of MLA Mitzi Dean in her new role as Parliamentary Secretary for Gender Equity. Everyone plays a part in leading and advancing gender equity for females in sport. What learnings will you take from International Women’s Day to adopt more gender inclusive practices within sport?